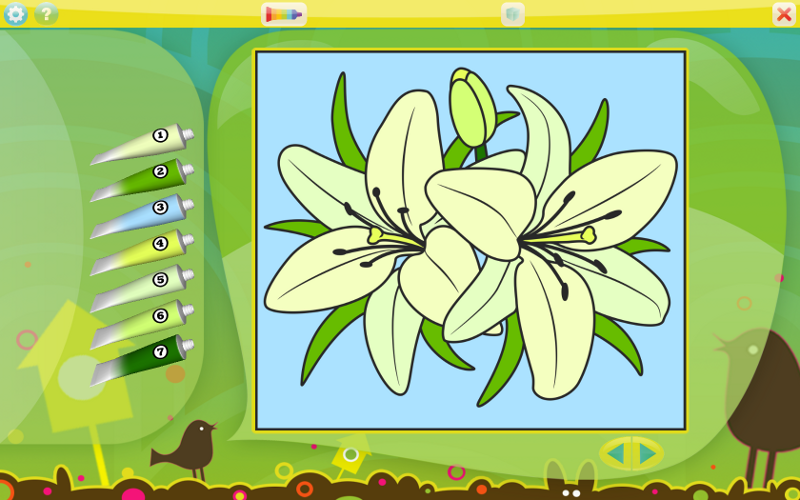 Color it by numbers enables little girls to create bright and colorful flowers on the computer while they learn to recognize numbers. Color and number recognition are two basic building blocks of learning, and color it by numbers brings both skills together. Girls can have fun learning while mastering computer skills as well. With many different beautiful flowers to choose from, color it by numbers will appeal to every little girl. ...... Just like the classic paint by number pictures that we all know and love, each on-screen image is a flower waiting to happen. Your little girl simply clicks on a numbered color at the side of the screen then moves the mouse to the section to be colored. Another click and the section fills with rich color. As she adds the colors, a beautiful and vibrant flower emerges. The software is also extremely flexible. You can easily change the pre-set colors to create new and different flowers or your little girl can use a palette of favorite colors to make a completely personalized flower. It's also fun to print the pictures of flowers and have a permanent piece of art that lasts for years. Have you ever forgotten to send flowers? What do the colors mean? Enhance image and correct color for digital photos or scanned photo images. Want to change color on something? ColorSwap will help you and keep shadows. Make your own color palettes, sample and store colors you like. Fix Any Color lets you selectively adjust colors in your digital images. Qweas is providing links to Color by Numbers - Flowers 1.0.0 as a courtesy, and makes no representations regarding Color by Numbers - Flowers or any other applications or any information related thereto. Any questions, complaints or claims regarding this application Color by Numbers - Flowers 1.0.0 must be directed to the appropriate software vendor. You may click the publisher link of Color by Numbers - Flowers on the top of this page to get more details about the vendor.